1921 George V was on the throne of England, Billy Hughes was Prime Minister of Australia, Harry Lawson (from Castlemaine) was Premier of Victoria and Charlie Chaplin starred in “The Kid”. Ginger Meggs made his first appearance in a comic strip, Australia beat England 5-0 at cricket (howzat ?} 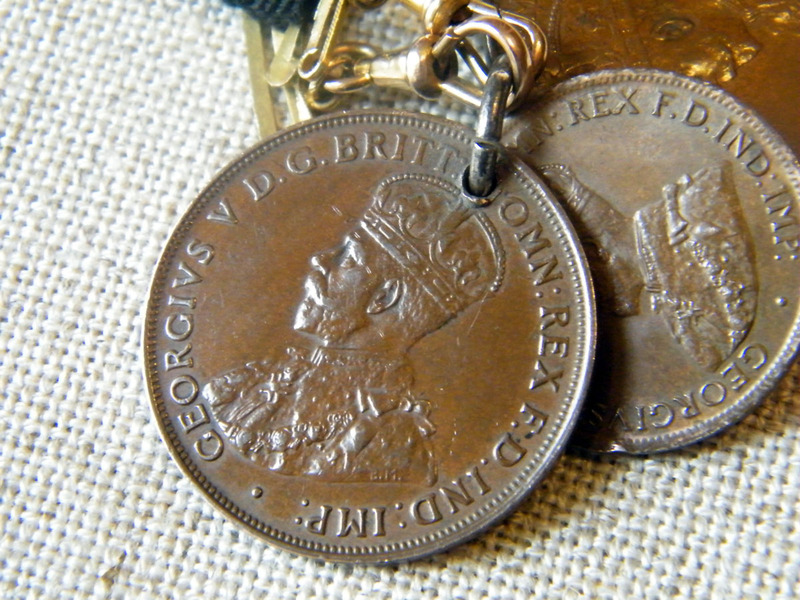 and Tom Tansey used three coins – – two pennies and one halfpenny — as a fob to weight the end of his watch chain, with the help of a black grosgrain ribbon. 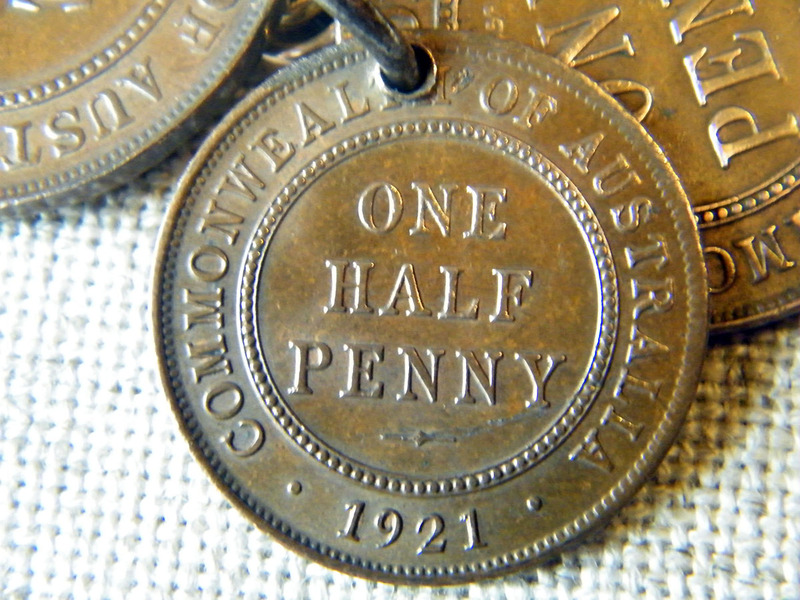 Since the Crimes (Currency) Act 1981 (Australia) it has been a criminal offence to deface or destroy current Australian currency coins but in the past it was quite common to punch a hole in coins and use them as a fob. And do I have a photo showing Tom wearing his watch ? Unfortunately no. There are plenty of photos of Tom in band uniform and but very few family photos of him. And so it is hard to work out exactly how Tom wore his pocket watch. 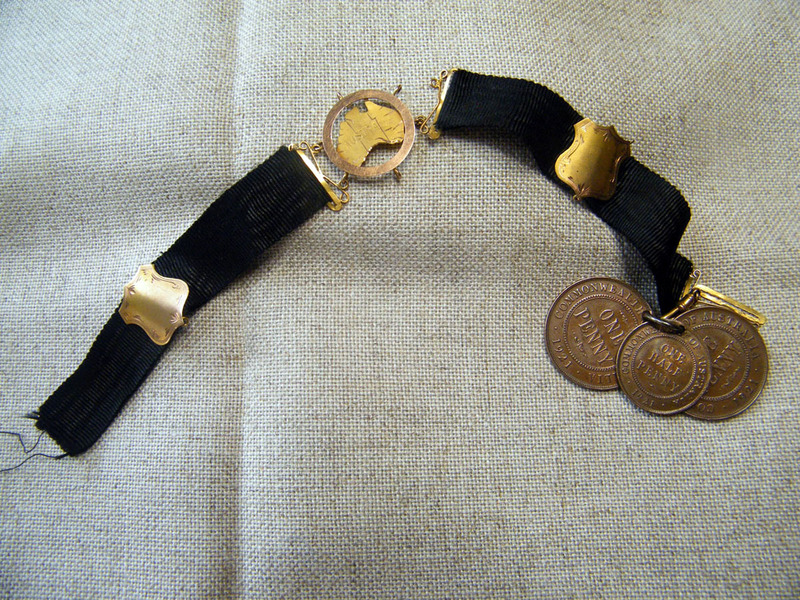 The map and two shields on the black grosgrain ribbon seem to suggest that this ribbon may have been worn horizontally with a chain and watch attached He may have kept his pocket watch in his trouser pocket or his waistcoat pocket. He may have attached the chain through a buttonhole. He may have ……I will probably never know. 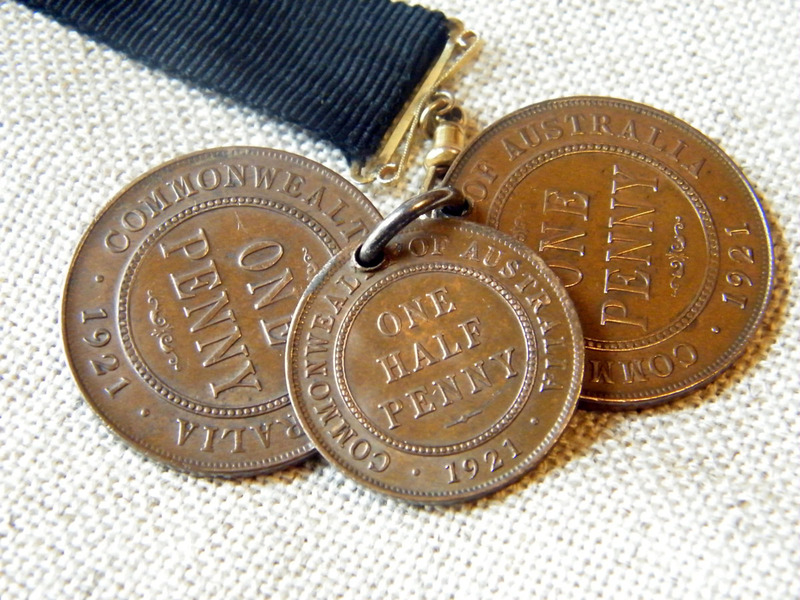 This entry was posted in Family Stories, Uncategorized and tagged 1921, fob, grosgrain, ha'penny, halfpenny, pence, penny, pocket watch, Tansey, Tom, watch, watch chain on August 15, 2015 by lazycoffees. 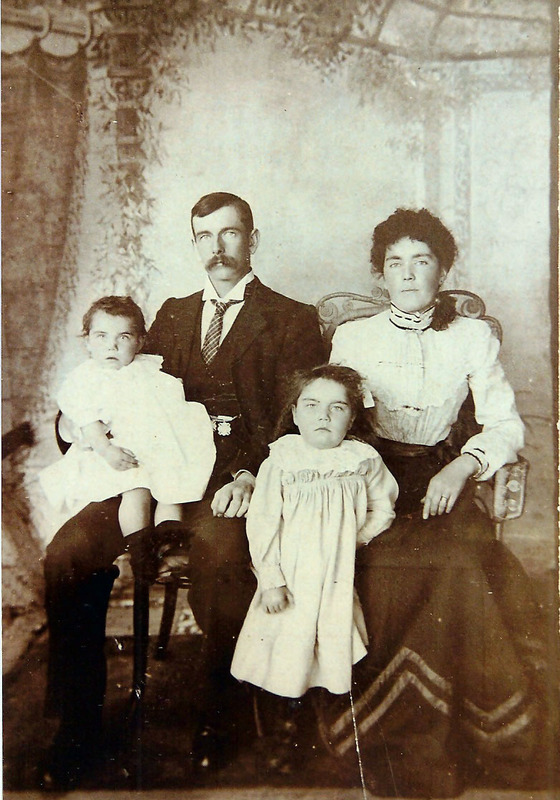 When Tom Tansey left Snitterfield near Stratford on Avon in 1888 to travel half way round the world to Geelong in Australia he knew that there was little chance that he would see his family again. I find that hard to imagine, sixteen years old and never to see your parents, three sisters and brother. again. 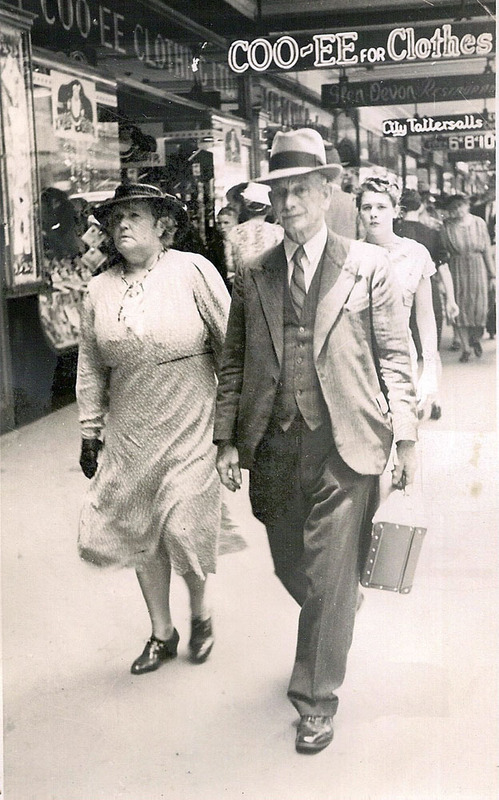 Another sister was born the year after he left but he was to meet her later on as she also came to Australia. 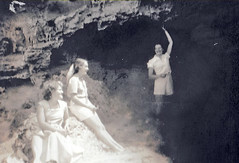 One consolation was that he came to live with his Aunt Letitia – his mother’s sister. 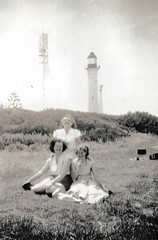 She had married Phillip Trickett and settled in Geelong. 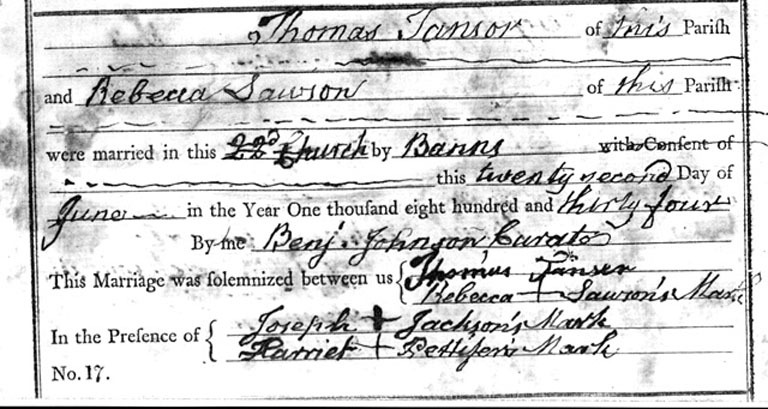 But she was a stranger to Tom as she had come to Australia in 1870, two years before Tom was born. 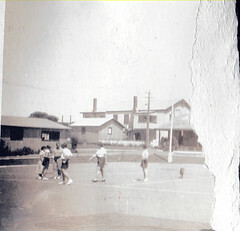 One thing Tom did have though was a photo of the kitchen that he left behind, the kitchen where he had grown up for sixteen years. There was a second brick oven outside in the wash house. It was there that the Sunday roast and Yorkshire pudding was cooked. 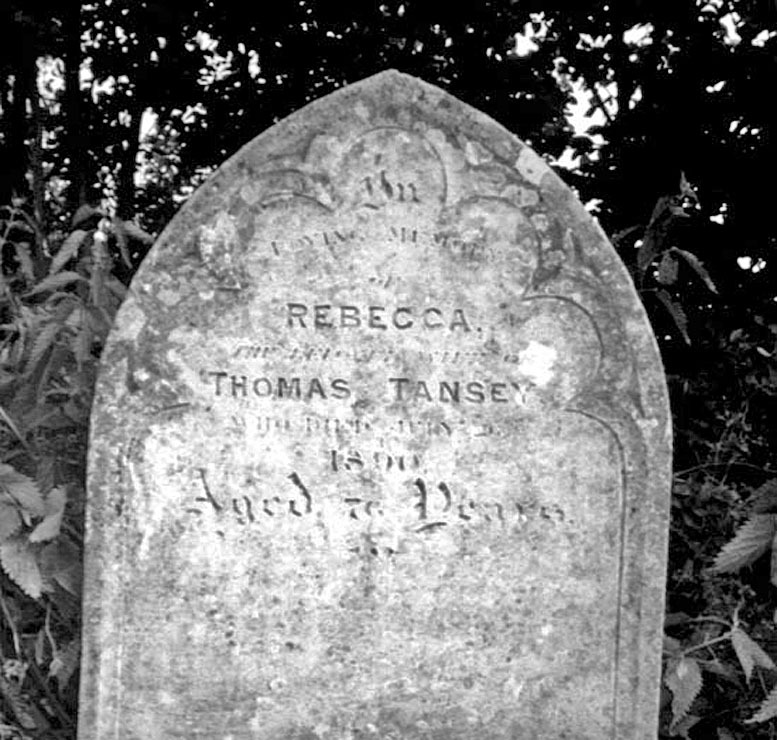 The neighbours would bring their dinners to be baked and were charged a penny to help to help pay for the wood – they would also bake pies and tarts for the week. 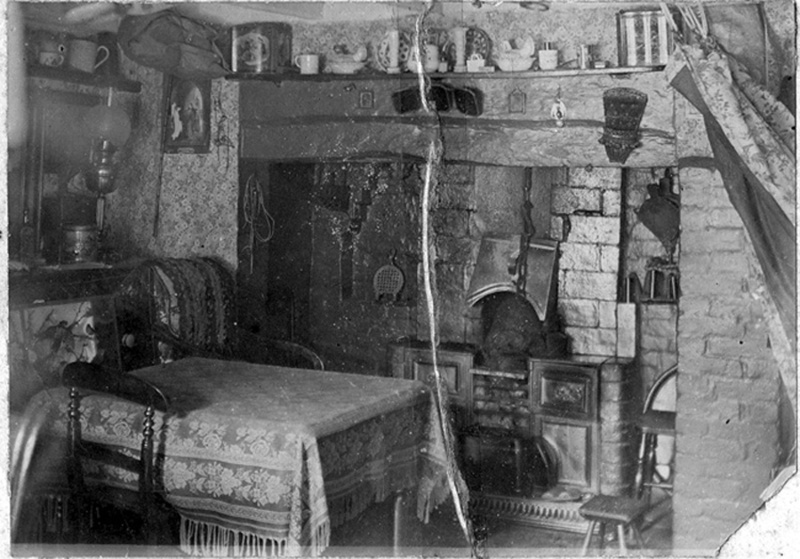 This kitchen was the place for the weekly Saturday night bath in a tub in front of the fire. It is where Tom’s mother sat to make rag rugs for the floor. It is where Tom’s father would sit by the fire to read his Birmingham Weekly Post with a stumpy old clay pipe in his mouth (his nose warmer) and the cat Moses 0n his knee. It is where Tom’s mother would set out for Gospel Oak to buy their honey and when there having to accept a cup of “tay” which had been strained through the seller’s hessian apron. It was from this kitchen that Tom would set forth to band practice. 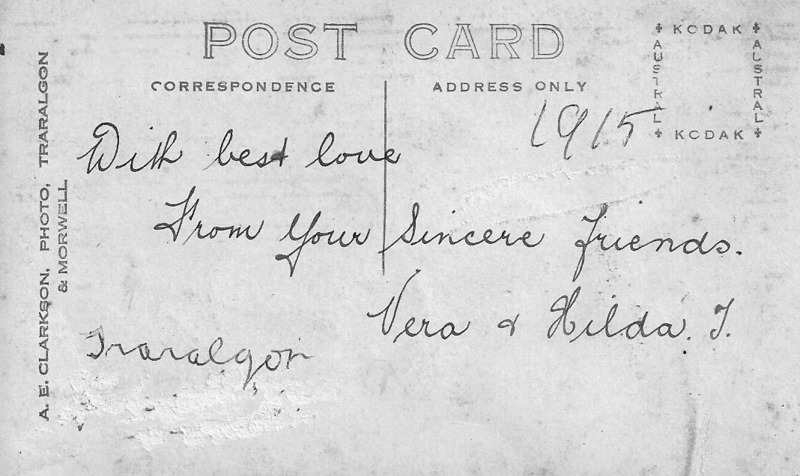 And from here he would also leave to go to school where he learnt his beautiful copperplate handwriting. 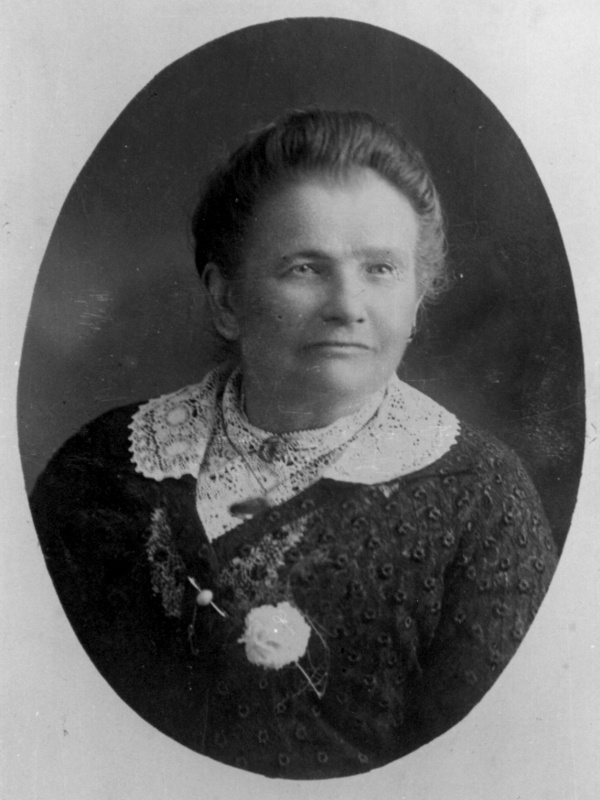 The details of life in the kitchen came from Ellen (Nin) Tansey (1889-1975), Tom’s sister who came to Australia as a war widow in 1920, to remarry and settle in Sydney. 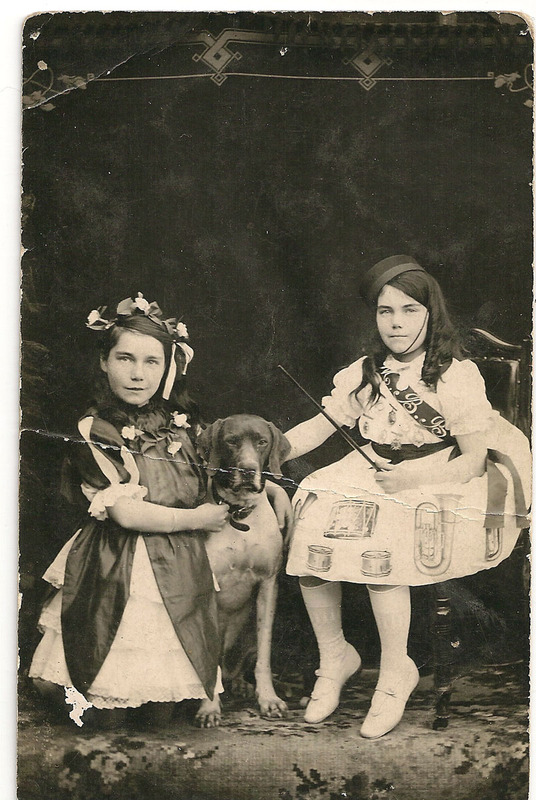 More kitchen related stories can be found through this week’s Sepia Saturday bloggers. 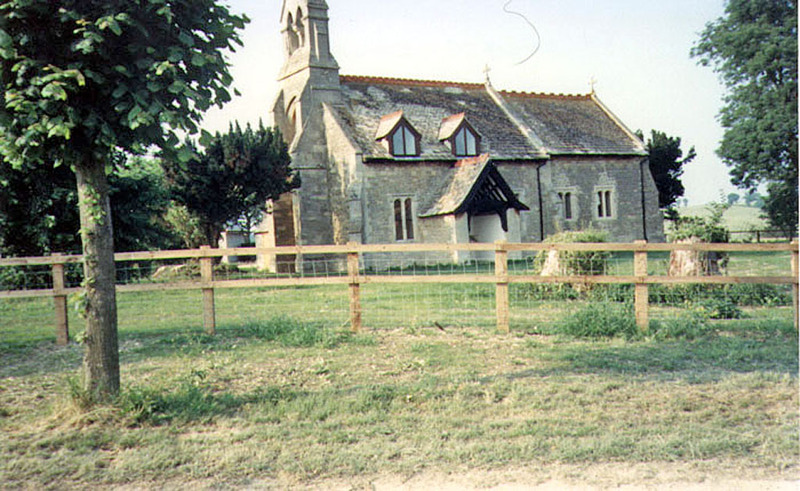 This entry was posted in Emigration, Family History, Family Stories, Uncategorized and tagged 1888, kitchen, range, Snitterfield, stove, Tansey on May 29, 2015 by lazycoffees. 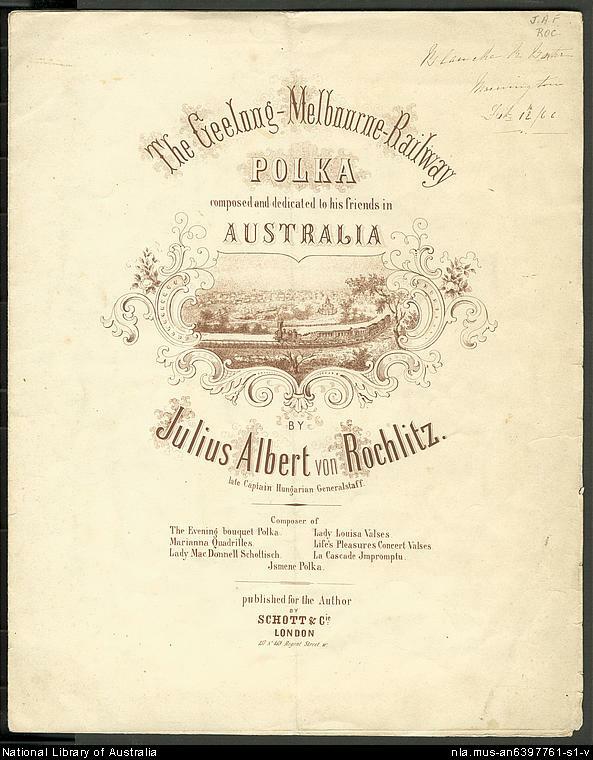 The railway line between Melbourne and Geelong opened in 1857 and in 1866 von Rochlitz published the Geelong – Melbourne Railway Polka, this copy from the National Library of Austtalia. It was a common practice for a new song to be commissioned for the band to play at the opening of a new railway. 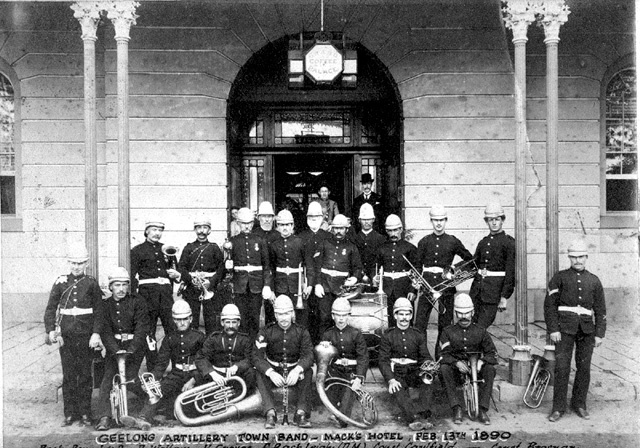 The Volunteers were present for the arrival of the first train and the official opening of the Geelong Railway Station and so was a band who played some spirited items. A huge banquet was arranged but unfortunately the train was late and the locals had their fill of the feast before the invited guests arrived, including the Governor, Members of Parliament and other dignitaries. And what could they possibly be playing ? And was Tom with the band when this photo was taken ? I don’t know. 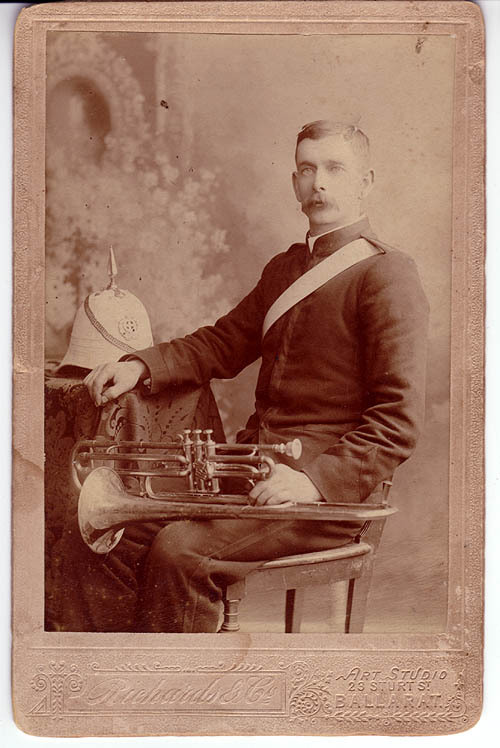 His portrait (below) was in the uniform of the Geelong Town Band c1900. This is my contribution to Sepia Saturday for this week but there are plenty more examples of polkas, violets, music and mystery posts to be found in the links on the Sepia Saturday page. 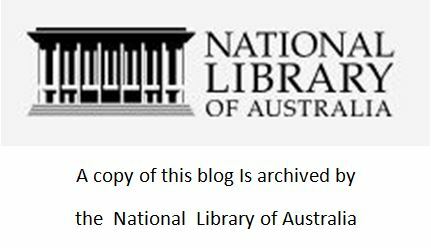 This entry was posted in Brass Bands, Family History, History, Music, Uncategorized and tagged bollard, Geelong, music, polka, railway, Tansey, von Rochlitz on March 7, 2015 by lazycoffees.